If you are interested in staying here, you will need to send a message to the host Christine & Yves indicating your interest. For a formal booking to ensue, Christine & Yves will need to send you an "invitation to stay", which you can then accept. 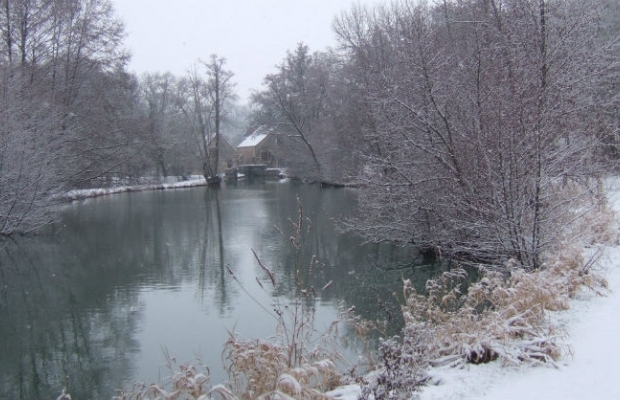 Independent Water Mill Cottage overlooked by an old and typical village of Burgundy, Rix mill offers, for your exclusive benefit, the luxury of 5.5 hectares of meadows and water inviting to wander around, daydream or observe and contemplate the rich nature and wildlife widely present. A self-contained holiday cottage has been equipped, combining the beautiful architecture of the era (built in 1743 before the French Revolution) and the comfort and nice decor one's want to find when on holiday. Spacious and bright, the accommodation receives the outdoor light through large windows offering an open view on the mill stream, the village and the river. The main room includes a fitted kitchen and a dining space, a living space (3-seat sofa - which is an extra high-comfort double bed - , television, internet wiring, WiFi and a large range of English and French books). An under floor heating system and a charming wood stove guaranty a great comfort, even in winter. The bathroom is equipped with a walk-in shower. The double-bed bedroom is installed on the mezzanine overlooking the main room. Situated in the heart of Burgundy region, within the "Chablis, Sancerre, Beaune vineyards triangle", Rix Mill is part of the 200 inhabitants Rix village, just 3 kms from the medieval town of Clamecy (5000 inhabitants), where all amenities and shops are available, and 2 hours drive South from Paris. 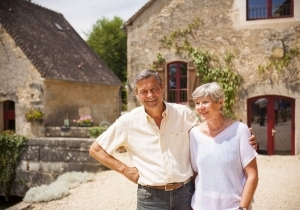 With a rich history, Burgundy offers a wide variety of tourist attractions and places to visit easily reachable by car from the mill: Vezelay (designated Unesco World Heritage site), Guedelon castle (one-of-a-kind project in the whole world ), Fontenay abbaye, Semur en Auxois, Auxerre, the Morvan massif and its lakes, the "canal du Nivernais",...and all the famous vineyards. As an alternative to the car, the surrounding countryside will also invite you to walks, bike rides and boating. Two bicycles (more can be hired in town) are at your disposal on site. Use of an inflatable boat, swimming or fishing are all means of enjoying the 1 km of river. Pétanque, badminton and table tennis can also be practiced onsite and, activities as yoga, climbing, canoe-kayak and micro lighting are available at very short distance.